Once again, Old Palm Golf Club provided a spectacular setting for the Easter Sunday Brunch held at the Club. The event was sold out, and itâs no wonder. The tables were decorated with fresh-cut spring flowers and brightly colored linens, and the members and guests in attendance were dressed to the nines with cool pastels being the dominant hues. As with every buffet brunch at the Club, there was a never-ending array of dishes, all perfectly cooked and beautifully presented. The buffet stations were laden with plump seafood, hand-carved meats, bountiful salads and mouth-watering side dishes. To add to the festive atmosphere, huge chocolate Easter bunnies adorned the dessert table. Outside on the Clubâs event lawn, the kids enthusiastically participated in a variety of traditional Easter events. 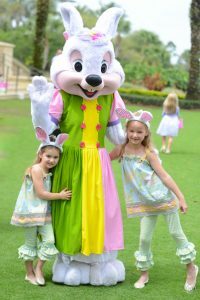 They scurried about the grounds hunting for Easter eggs, had their pictures taken with a costumed Easter Bunny, and had the chance to hold live bunnies. It was so much fun, even the parents joined in without having to be egged on..